On Tuesday 11th September Penrith & District Farmers' Mart LLP held their Highly Important Special Sale of 4,550 Breeding Sheep, including a Prize show for Mule Gimmer Shearlings and Mule 2 Shear Ewes, generously sponsored by Carr's Billington Agriculture. The pre sale show was handled and judged by Mr D Kennerley & Mr C Heath, who had some excellent pens of sheep presented before them. Champion pen of Shearlings was awarded to Messrs JJ & E Lawson & Sons, Kirkland Green, who later received the 'John Mounsey Memorial Trophy', and sold for £200, to Mr C Heath (judge). The 2 shear show also attracted outstanding entries, with Messrs W&R Lawson, Stubbsgill Farm taking first prize and sold for £205, to Messrs Jenkinson, Clifton Moor Farm. Credit must be paid to all vendors of stock on this day, as all sections were all well presented given the weather experienced. The huge attendance of both local and travelled buyers were delighted with choice. Trade was strong for 2-3shear Mule ewes, up keeping to 2011 figures for most vendors. 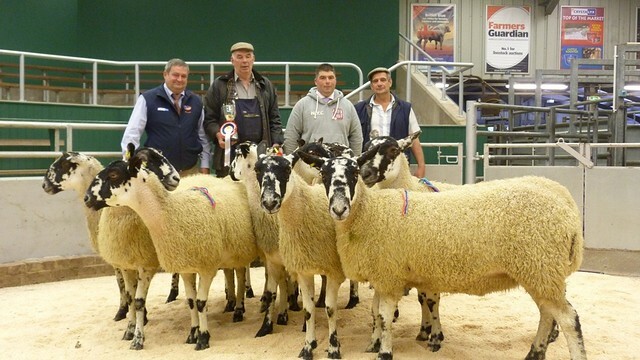 Mule gimmer shearling trade was outstanding, with a rise of £13.88 on the year. Continental sheep would be the hardest section with buyers being more particular in selecting & bidding.